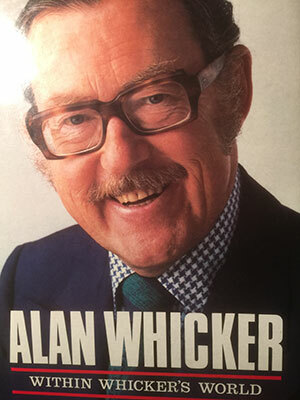 I am almost embarrassed to admit that yesterday I managed to pick up a hardback copy of the late Alan Whicker’s autobiography for £1.00. I say that because Whicker’s life deserves to be remembered, read and celebrated and such a full life and contribution to society must surely come at a price considerably more than one UK pound. Alan Whicker, like James Cameron, was a quite remarkable journalist who lived through and reported on some of the last centuries greatest historical moments. Most fondly remembered for his truly ground breaking television series, Whicker’s World, he lit up a grey, cold and fed up British television audience with reportage from some of the most exotic locations on the planet and all done with his legendary English gentleman manner. Within Whicker’s World is an unsurprisingly gentle and charming account of his life in Fleet Street and on television where he became a confidant of many of the great stars of the stage and screen as well as actors, politicians and royalty. He was charming but without being a pushover, Whicker knew what he wanted to get from his subject and more often than not got it through his unique style, a style long and very sadly gone in which the guest was deemed more important than the interviewer. The book is littered with wonderful anecdotes from a lifetime dedicated to travel and journalism. He describes quite brilliantly how, in 1950s Egypt the local men would expose themselves to white European women until, a group of the women got together and agreed that, rather than take offence, they would reply in Arabic with “Is that all you’ve got?” which, apparently, went down very badly and prompted the men to stop doing it! Strong stuff indeed, interestingly, for a man who was working for independent television, he praises the BBC for their lack of bias, not sure he could do that today but there you have it, times change! !